Foreclosures can be home run investments, but, if you don’t do your due diligence, they can just as easily be the investment you regret. Today there are tons of online resources for foreclosure lists, but they are not all made equal. You want to make sure that the list you’re using (especially if you’re paying for it) isn’t an old list. 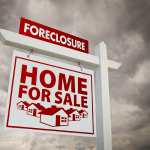 All foreclosures are public record, and if it’s public knowledge for some time, then you’ll be far down on the list of letters those owners will be receiving. The courthouse records will always be the most accurate, but if you don’t want to spend your days thumbing through records, find an online resource who provides you with fresh lists. You want to the be first one in the door, and the last one to leave. Next, know what you’re looking for. Sure, a property can look like a great deal from the initial number, but it could just as easily be a dud. Knowing your criteria means you won’t invest in a property that’s not a fit for you. Not every property’s going to be a fit, so don’t be blinded by what looks like a screaming deal, when, in fact, it’s not a deal for you. When you find a property that matches your criteria on paper, we highly suggest you go take a look at the house, especially if you don’t have a lot of experience buying foreclosure properties. Although you might not be able to get inside, you’ll want to get a feel for the area, the neighborhood, and you can get a good idea of the property’s condition just by checking out the exterior. It also helps to know the history of the foreclosure – how long has it been sitting, how long were the occupants behind. This information will give you another glimpse into how the property may have been treated. And always overestimate the repairs, especially with a foreclosure. People who aren’t paying their mortgage, aren’t keeping up the property either. Foreclosures can be great investments, as long as you walk into them with eyes wide open.